Day 1 on the job–the morning began with a tour of Bindley Bioscience Center for the new interns (Barrett, Caleigh, Emma, and Paige), during which Susan (the world’s best receptionist) kindly showed the fledgling researchers around and gave them the run-down on BBC do’s and don’t’s. The remainder of the day was spent working on gene design via Benchling, researching potential assays, and meeting with Drs. Rickus and Solomon. Important topics they raised included the importance of an experimental design plan, the need to begin with the basics (i.e. how do we know a protein is being expressed?) before delving into more complex issues of function, and gene design specifics. Nine out of ten genes needed for luxury phosphorus uptake were ordered at the conclusion of Day 2! Throughout the day, genes were restructured for use with 3A Gibson Assembly protocol, and new constituent promoters were added (both sigma70 and sigmaS to arrest growth in P E. coli). Primer design began. Additionally, the hunt for assays continued for both phosphorus and nanowire constructs. Interns learned how to optimize codons using IDT both automatically and manually, checking for segments such as EcoRI, SpeI, XbaI, PstI, and HINDIII that should not be present in coding regions of constructs, as these sequences code for restriction sites. A review of sterile technique and iGEM kit DNA extractions in the lab comprised a majority of the morning. Some golden rules of sterile technique: Always wipe down the lab bench with 70% ethanol before beginning; work as close to the flame as possible, as it creates a sterile “bubble”; and get into and out of pipette tip boxes as quickly as possible to keep them sterile. The autoclaving of new pipette tips and water was also used for demonstration purposes. Afternoon work consisted of continued definition of desired assays and design of nanowire genes. The creation of ready-to-use plates was the focus of lab work on Thursday. Interns followed an existing protocol to make plain LB agar, LB agar with ampicillin, and LB broth, culminating in the pouring and storing of too many plates to count. Caleigh, Sean, Suraj, and Paige took a field trip to the West Lafayette Waste Management facility to speak with Sara Peel of the Wabash River Enhancement Corporation (WREC) and Angela Andrews of the City of Lafayette Water Pollution Control. It was discovered that the facility is newly permitted for phosphorus removal; however, a chemical method as opposed to a biological one will be implemented August 1 for both political and financial reasons. The up-front cost for chemical treatment was less than for biological treatment, which made it the optimal choice for the time being, but the facility plans to switch to biological treatment as soon as it has the funds to do so, as this will be more cost-effective longterm. The team plans to return to the plant sometime in July to receive a full tour and collect wastewater samples to be used for testing. 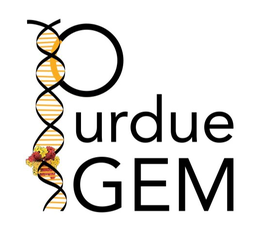 Brainstorming for both background content for the official iGEM project wiki and a project timeline were completed in addition to an establishment of a protocol for completing lab notebooks. A Work Breakdown Structure (WBS) and Gantt Chart were constructed to record timeline information. Practice transformations of GFP and RFP kit plate parts were completed by the interns throughout the day. The conclusion of a successful first week!